Few months ago, I reviewed a wonderful product from a beauty brand Herbal India (read the review here) and liked its effect on my skin. So I was more than interested to give some other products a chance from their product line. 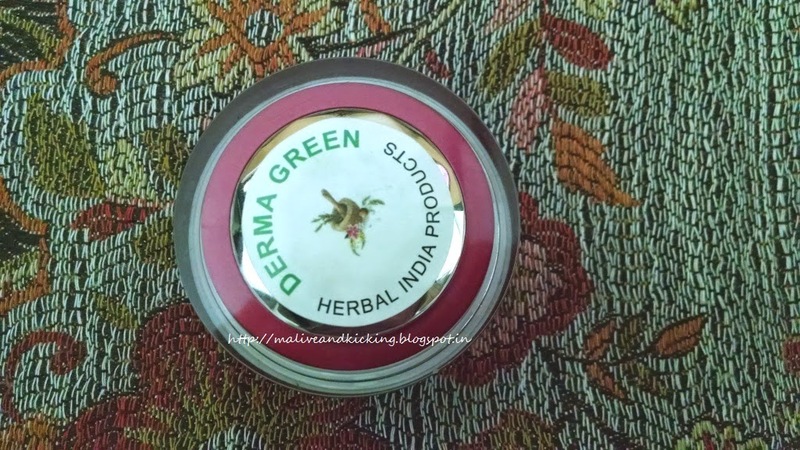 I was sent Derma Green Skin whitening Cream which is another variant of skin whitening creams that Herbal India sells. I have been using it for many days and today will share my review on it. Product Claims: Derma Green Cream helps to get back your youthful skin with glowing healthy unimaginable glow. Protects from sun burn, tanning and reduces the overall production of Melanin. Tightens the skin and delays the formation of wrinkles. No black and white heads and helps to soften the Zits. No pimple and acne, reduces the inflammation and clear the pores. No undereye dark circles and it effectively clears the skin. No scars and it evens the skin tone. 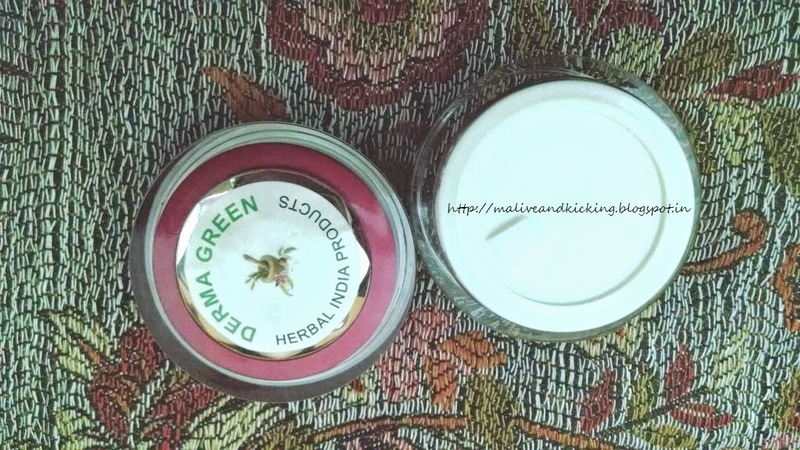 Packaging: Derma Green Plus Herbal Whitening Cream is packaged in a maroon plastic tub pack with a sticker on its top lid having the product name on it. The plastic jar has a tight screw cap on the top and an inner white disc cap to keep the content safe in the packing. The ingredients and price details are printed at the bottom of the packaging. The cream is infused with the goodness of natural ingredients like Emu Oil, Almond Oil, Aloe Vera, Lemon Grass, Red Sandal, Turmeric, Honey, Tulsi. The 30 gms content in the pack is sold at a price of Rs.2500 and shelf life of the pack is 24 months. 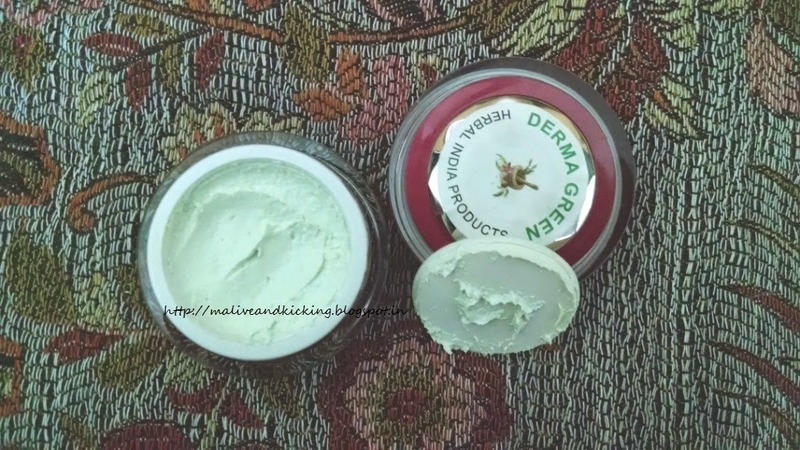 The Derma Green is quite a thick textured cream in light mint color. The cream smells very nice mix of floral and spicy notes that actually is uplifting and will not cause irritation to sensitive noses. I personally liked it too. The brand instructs to apply this cream as an face mask that has to be left on skin overnight to bring out the optimal outcome. Following the instructions, I applied the cream on my face as well as the neck area which should always be considered as the extended facial area while applying any beauty enhancement products. 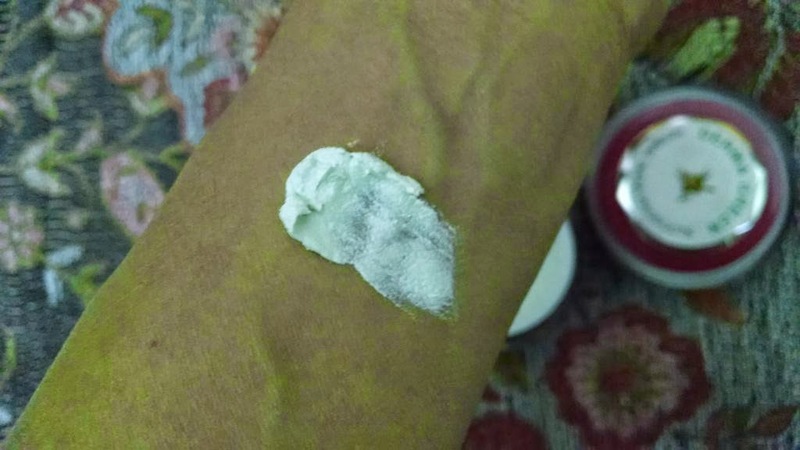 This cream needs extra efforts to spread evenly on skin, might be due to its thick texture. The next morning, I washed the cream off with a mild cleanser. The instant effect of the cream is the soft skin with some youthful glow. As I followed the similar regimen for almost a month, I noticed considerable improvement in my skin tone. I don't claim that the whitening of skin means drastic change in complexion in few applications, but the long term effects would surely be worth noticing. The cream claims to reduce scar marks, acne and zits. But I am a victim of none of these, so cannot comment on the effectiveness of cream on these issues. Yes, the cream has lightened the tanning on my forehead and I am expecting the forehead skin to evenly mix with other parts of face with prolonged usage of this cream. Causes no burning or irritation. Safe and travel friendly packing. 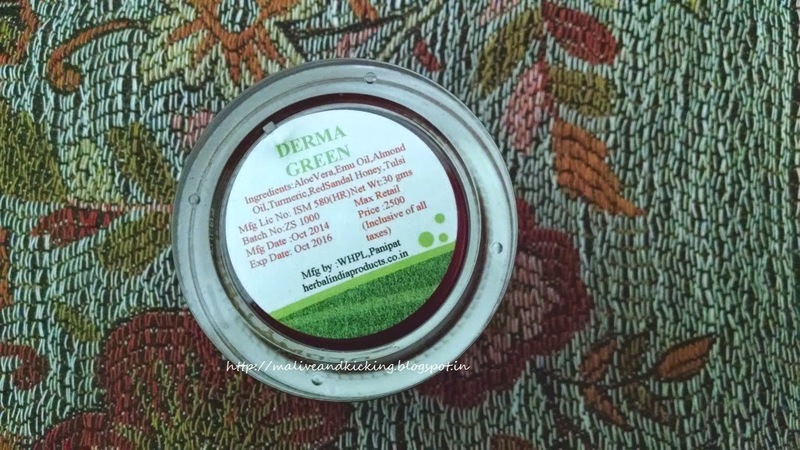 Derma Green Skin Whitening Cream is a herbal formulation to treat the skin by reducing dark spots and pigmentation, and leaving a radiant, even skin tone without any harmful effects. seems to be a useful product, though its little costly. it helps to improve the skin tone n texture for sure. A very Denim Story/ Hi, how do you Denim? Was That Really A 'Happy' Hair Challenge? ?